Maria, assuming that you don't mean change to one in ten, please send in your list of the thousands of names of women needed to achieve gender parity. Oh, and while you're at it, enclose a cheque for the – what was it? –350,000 GBP (in letters: three hundred and fifty thousand) you took from the taxpayer. That would pay for the first three statues on your list straightaway. News today that someone – probably the UK taxpayer – has stumped up 100,000 GBP for a statue of Jane Austen to be erected in Basingstoke. Although she was born nearby, Basingstoke is about the last place in Britain that one would associate with the world of Jane Austen. Well, let's not be judgemental. Unfortunately, no one has any idea what Jane Austen looked like, so the sculptor will have to use more than a bit of imagination. He is certain, however, that 'it needs to be a believable person'. Here we go again: likenesses without likeness. There was a reason that Plato didn't want artists and their fakery in his Republic. You don't think that a gang of leftwing teenage snowflakes has locked the editorial staff of Zurich's Tages-Anzeiger in the cellar and taken over production, do you? 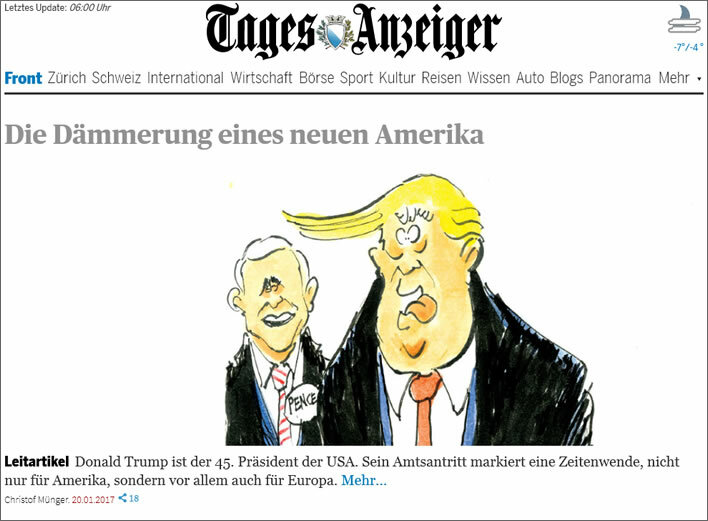 The Zurich Tages-Anzeiger hails the Golden Age of Trump: 'The twilight of a new America'. Surely not – they would have shown much more decorum. We look forward to further fair and balanced commentary during the rest of President Trump's term from these juveniles, who are clearly incapable of controlling themselves. After 70 years of progress this joke is no longer tenable. It provokes lofty challenges to define what is meant by 'English'. Who are they anyway, this mongrel race? It is bad enough these days having to write 'British' when you really mean 'English'. Mikes, his editor, publisher and printer clearly had no objection to the use of 'English' here, nor the hundreds of thousands who bought his book. It is especially tedious listening to people opining about 'British values', both for and against. If the best that one can come up with is warm beer, cricket and queuing then the country really is in trouble. Still, that was John Major, which explains a lot. The present lot are just as bad. Clearly, it's time to become a Hungarian citizen under that nice Mr Viktor Orbán. He doesn't mess about wondering who Hungarians are. Why are women still wearing shoes that wreck their feet and toes and get stuck dangerously in pavements? Many men sit around in virtually identical dark suits and sober ties all day and no one remarks on this social shame. So why is it a newsworthy disaster when two women appear in similar outfits in similar colours? In the case of item 1 we are waiting for the UK taxpayer to be required to improve the pavement in Downing Street. For well over a thousand years in Europe autocrats have amused themselves building grotesque monuments to their egos. The autocrats can be religious or political, brazenly feudal or superficially democratic: it really makes no difference. Their monuments may differ – cathedrals, palaces, great buildings etc. – but really these objects are all the same: paid for by the peasants' labour in one way or another. Subsequent generations walk in crowds around and through these structures in wonder and admiration, conveniently forgetting how the money for these magnificences had been screwed out of previous generations. If you think the mad architectural daydreams stopped with Versailles and the Trianon, you are forgetting Adolf Hitler and Albert Speer. 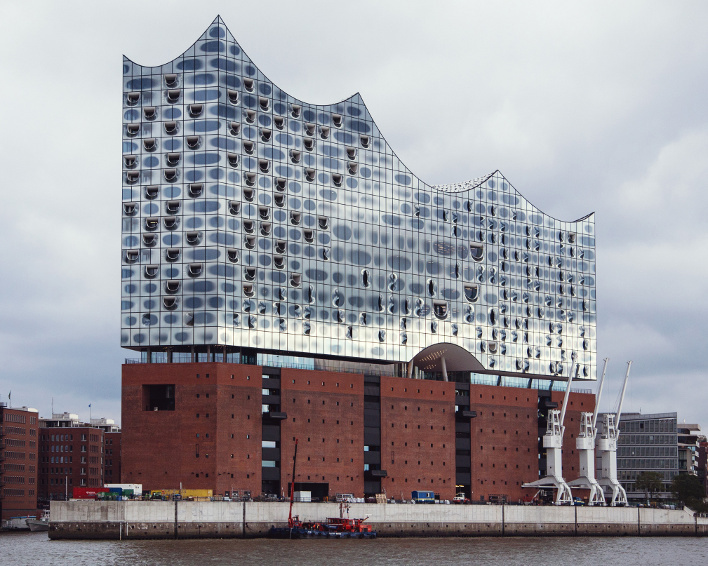 Today's forensic specimen comes from Hamburg: the Elbphilharmonie. The architecturasts swoon in delight; the taxpayers swoon too, but not in delight. 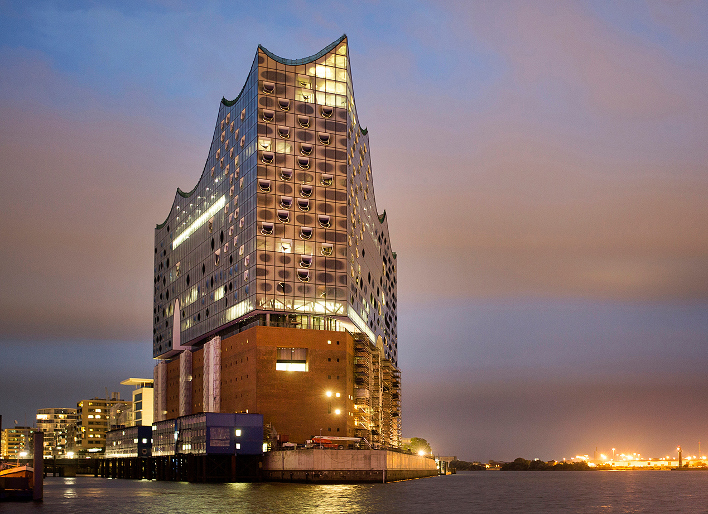 The Elbphilharmonie is a concert hall. OK, let's be fair, there is a cafe, a hotel, some apartments and a car park, too. 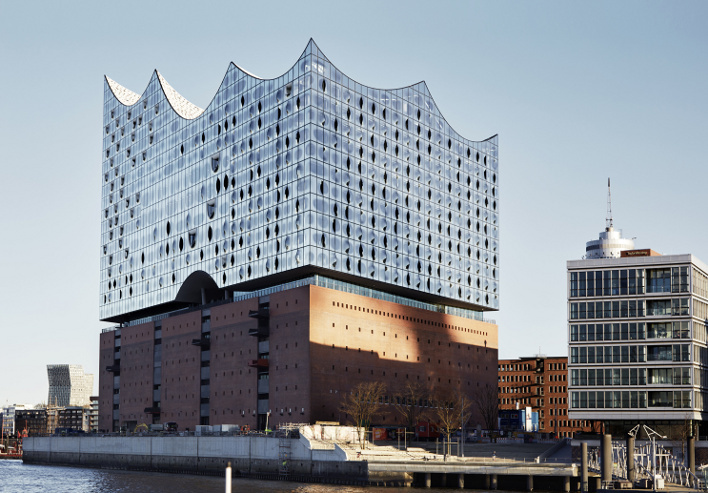 Originally it was started in 2003 and was supposed to cost 77 million EUR. It was supposed to be finished in 2010 but took until 2016. 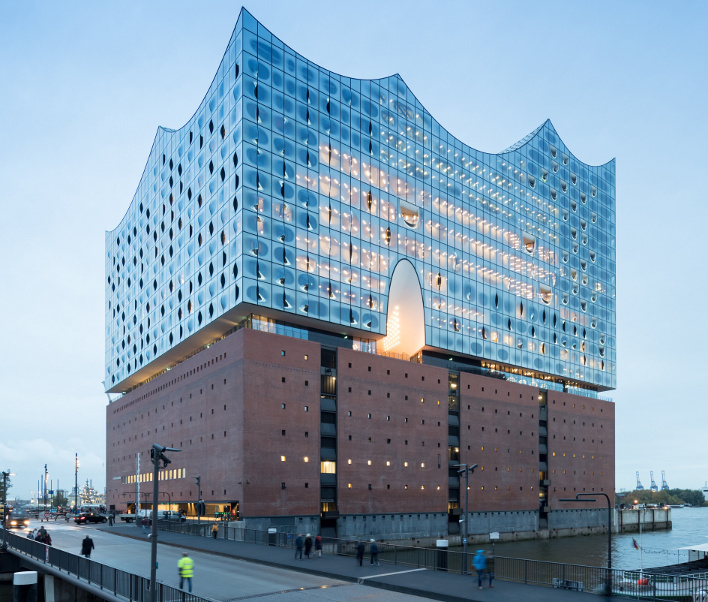 The final cost was 789 million EUR, ten times as much as planned. Put kindly, the repayment plan is a triumph of hope over realism. 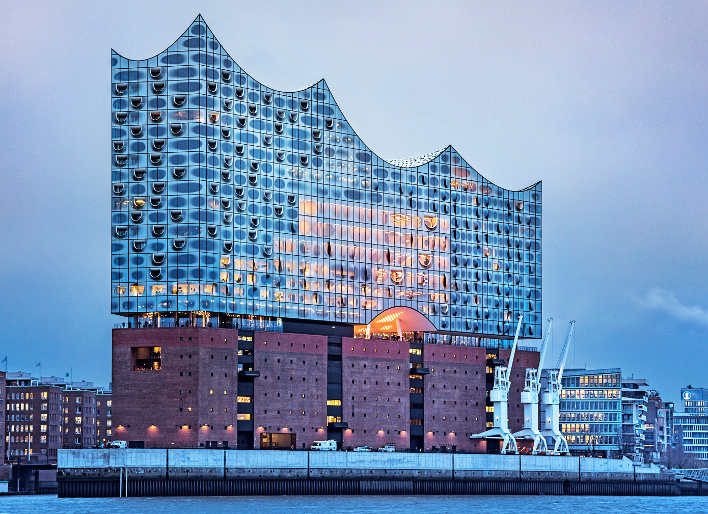 The bent-backed Hamburg peasant is comforted with Schadenfreude at the thought of what the bent-backed peasants in Berlin are going through with their new airport, the Flughafen Berlin Brandenburg – slightly more useful than a concert hall and a hotel, admittedly. That airport was supposed to cost the peasants of Berlin 1 billion EUR. The current cost guesstimate is well over 6 billion EUR and rising. Given the defects of the building work, quite reasonable people doubt that the airport will ever open. What happened with the peasants over Versailles and the Trianon? Hmm…	there's a thought. Oh, sorry, I forgot: nowadays we have a vote – we can choose our autocrat. Our interest was aroused by the surprisingly high costs of annual rail season tickets in Britain. These are issued for single routes, such as that, for example, between Birmingham New St and London Euston. The 'Standard Class' Adult costs 5,760 GBP, the 'First Class' Adult 8,928 GBP for the year. This seems to be an awful lot of money. A comparable rail journey in Switzerland is the route Zürich-Bern, at 123 km a bit shorter than Birmingham-London (201 km), but, as you will see in a moment, the distance doesn't really matter. 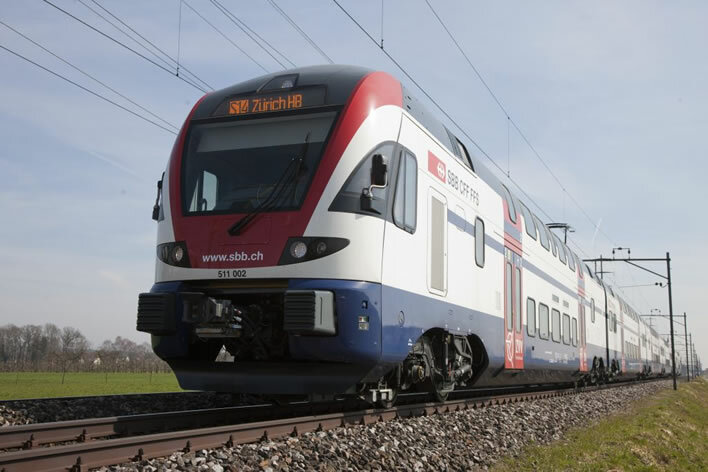 An annual season ticket for the route Zürich-Bern will cost you, second class, 4,464 CHF, that is 3,546 GBP and first class 7,596 CHF, that is 6,034 GBP. All in all about 40% less. In Switzerland, however, no one would do it this way: they would purchase a 'GA', a Generalabonnement, a 'General Travelcard' that lets you travel a year long anywhere in the entire rail network and also covers a wide range of buses, trams, ships and reduced price ski tickets. The GA costs for second class 3,860 CHF, that is 3,066 GBP	and first class 6,300 CHF, that is 5,005 GBP. Pensioners and various other categories are appreciably cheaper. Many companies and administrations buy GAs for their employees. Given the anecdotal evidence for the pleasures of rail travel in Britain on overcrowded commuter trains it is surprising that the price mechanism seems not to work. The joy of rail travel there seems to be a very inelastic commodity: demand and prices rise despite no amount of upset, inconvenience and crowding. Commuter trains in Switzerland can be crowded too, but travellers are not financially crucified in the same way as they are in Britain. The government minister responsible suggests that the money is paying for improvements to the system, but sane financing would improve the system then charge for the improvements. It seems odd to force today's travellers to pay for the benefits that only travellers in five years' time will enjoy.